Crossed Countries: China, Kyrgyzstan, Uzbekistan, Turkmenistan, Iran, Turkey, Bulgaria, Serbia, Croatia, Slovenia, Italy. Day 5. (Part 1) A New World Record is set up! Great news! We just have arrived in Venice in a new World Record time. From Shanghai to Venice we only needed 5 days and 18 hours and 22 minutes for in total 12 575 km. We, Rainer Zietlow, Peter Bakanov and Dmitry Makarov, drove with the new Volkswagen Tiguan TSI 150 h.p. on the trails of Marco Polo on the ancient Silk Road from East to West. Read more about Day 5. (Part 1) A New World Record is set up! Day 2. Goodbye, China! Hello, Central Asia! Having driven in the Western China, we put up with regular on-route police checks, as well as the fact that our documents were checked even at the entrance to a petrol station. However, a great four-lane highway allowed us to move in good pace, so at 08.00 pm we passed Urumqi, turning the road to Kashgar and the border with Kyrgyzstan. Read more about Day 2. Goodbye, China! Hello, Central Asia! We are now at the starting point. The representatives of the German Consulate will witness the start time and fill it in the official form. The car is refueled, washed and prepared for the upcoming six days of record-breaking long distance tour. Read more about Day 0. We started! Day 24 – Hello, Shanghai! Our plan for the day was to get up early and have a really long ride. As simple as that. There were 1,300 km to go to Shanghai, but the next morning we had to be energetic and cheerful at the end point of our inspection tour and the starting point of the world record – in Shanghai. Read more about Day 24 – Hello, Shanghai! We didn`t have time to rest. We need to finish all our uploadings of the days 16, 17 and 18 and fix some bugs on the website www.tiguan-silkroad.com. It took about 3 hours and after that we continued our trip. We came to the Old City of Kashgar to make filming near Camel`s monument to mark our Silk Road story. Day 18 - Hello, China! The task seemed quite simple, especially because we were not far away from the borderline between Kirghizia and China yesterday at dusk. It seemed to us that it would not take long to reach it and relax, but adventures started at night: we first had to soil our wheels passing by the landslide, and after a couple of kilometers we faced a really off-road section. Read more about Day 18 - Hello, China! Day 17 - To the mountains! Waking up at five in the morning and going further without thinking twice is usual for traveling, isn’t it? It turned out that we had spent the night almost in the mountains. Having driven just a few tens of kilometers on the morning, but already busy road from Tashkent to Andijan, we moved beyond the mountain pass, with the Uzbek plain and the border lying ahead of us. Read more about Day 17 - To the mountains! It was the second day of our stay in Ashgabat that we decided to get a better idea of how and by what the capital of Turkmenistan lives nowadays. But first of all, let me tell you about those interesting meetings that we had since early in the morning. Day 12 - Goodbye, Iran and welcome Turkmenistan! After staying for a night in Mashhad we went to Sarakhs town in the north-east part of Iran, where we wanted to cross the boarder between Iran and Turkmenistan. Iranian boarder we crossed quite normally, but we were surprised, why iranian customs decided to put our car to the weighing-machine, because Volkswagen Tiguan isn`t a truck. Read more about Day 12 - Goodbye, Iran and welcome Turkmenistan! Day 7 - Iran. Meeting with our partner. In the morning close to Erzurum we started checking our car and making order inside, before crossing the boarder between Turkey and Iran. So we put all our staff outside the car and were surprised, that we had a lot of free space, we`ve never used before. Volkswagen Tiguan is a really much bigger inside, that it seems to be. Read more about Day 7 - Iran. Meeting with our partner. Final Prepartions for The New World Record Project "Tiguan-Silkroad"
A new challenge is coming up very soon. 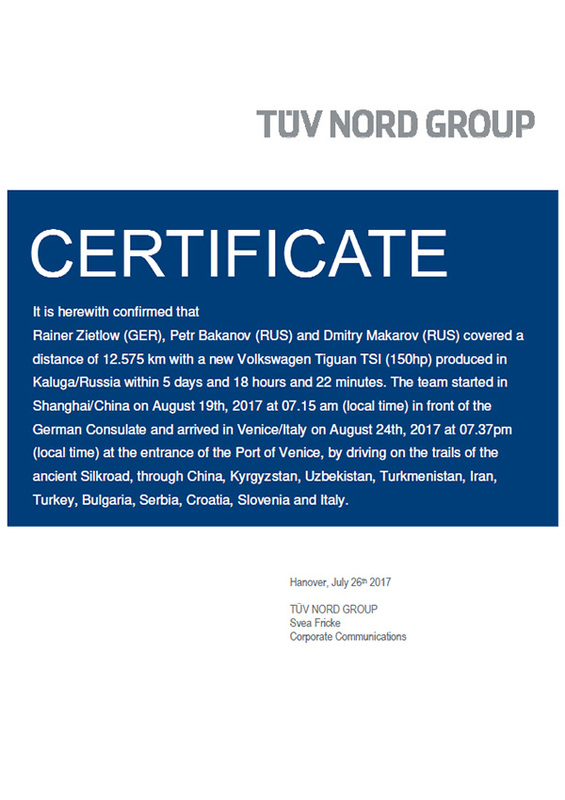 This time Rainer Zietlow and his team want to drive the 12.300 km long traditional "Silk Road" from Shanghai to Venice with the new Volkswagen Tiguan TSI with 150hp produced in the Russian Volkswagen factory in Kaluga. You can see our map showing the exact route. 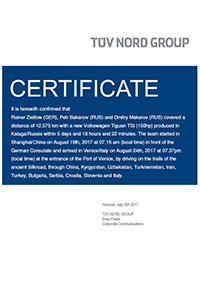 Read more about Final Prepartions for The New World Record Project "Tiguan-Silkroad"